SYNOPSIS:At 4:00 PM today, the Low Pressure Area (LPA) was estimated based on all available data at 515 km East of Surigao City, Surigao del Norte (9.1N, 130.1E).Northeast Monsoon affecting Luzon. 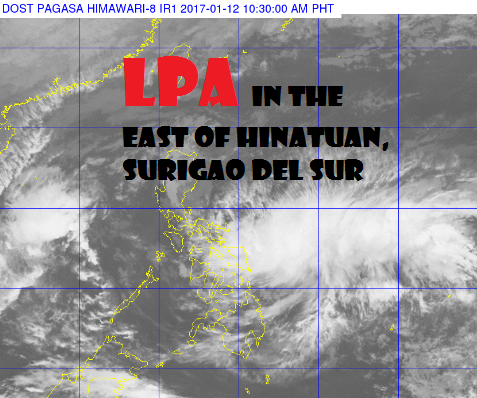 Synopsis: AT 10:00 AM TODAY, THE LOW PRESSURE AREA (LPA) WAS ESTIMATED BASED ON ALL AVAILABLE DATA AT 780 KM EAST OF SURIGAO CITY, SURIGAO DEL NORTE (9.6ºN, 132.6ºE). *Residents in these areas are alerted against possible flashfloods and landslides. SYNOPSIS: AT 4:00 AM today, The Low pressure area (LPA)was estimated based on all available data at 795 KM EAST OF Hinatuan, Surigao Del Sur ( 9.2N, 133.5E).Northeast Monsoon affecting Luzon.